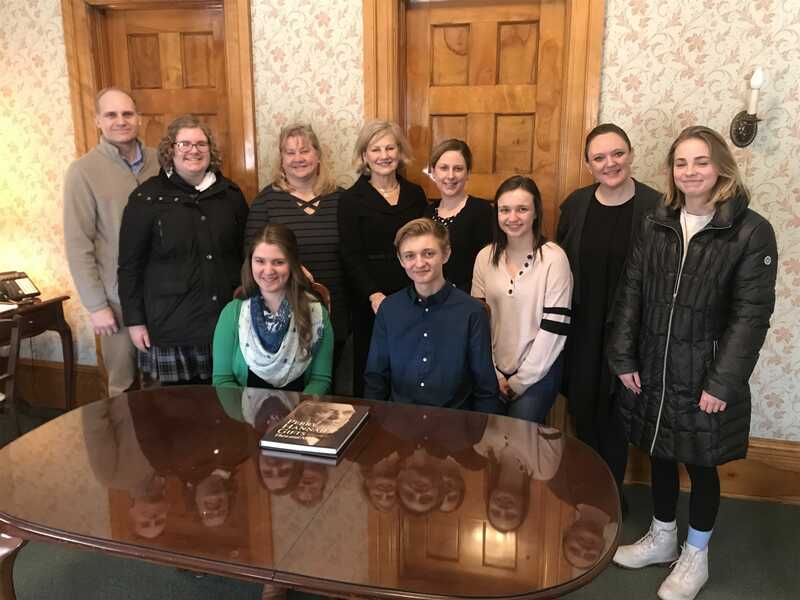 Our funeral home sponsored the Perry Hannah "Leadership Lessons Learned" contest which was created to inspire future leaders and encourage reading about our region's rich heritage. This special scholarship opportunity was coordinated by Peg Jonkhoff and Fred Hoisington, co-authors of the book Perry Hannah's Gifts, Then and Now, and members of the Grand Traverse Regional Community Foundation's Youth Advisory Council. High school juniors and seniors in Antrim, Benzie, Grand Traverse, Kalkaska and Leelanau Counties were invited to apply. Books were available at the Traverse Area District Library, High School libraries, Grand Traverse Regional Community Foundation office and the Reynolds-Jonkhoff Funeral Home. The co-authors donated this book to all local high school libraries during 2018 to help celebrate the Perry Hannah Home's 125th anniversary year. The students emailed their 300-500 word essay to Gina Thornbury at the Foundation and addressed the question: After reading Perry Hannah's Gifts, Then and Now, how can you apply leadership lessons learned to your own future? Gina provided the ten essays submitted anonymously to the Foundation's Youth Advisory Council members in January 2019 and they determined the top five essays. Then, Peg, Fred and Tom Gorsline (publisher of this book) read these five anonymous essays and determined the winners. The first place winner was, Marie Krueger, who received a $1,000 award and this winning essay will be published in the eventual third printing of Perry Hannah's Gifts Then and Now. The second place winner, Garrett Kesner, received $500. Thank you to all students who read the book and participated in this very special essay contest. Perry Hannah's leadership lessons legacy and his many gifts of land and architecture continue to evolve in our community. A few examples include the land for the Carnegie Library which is now home to the Crooked Tree Arts Center, Rock and Mineral Club with space available for public use in the Reynolds-Jonkhoff Boardroom or the Park Place Hotel with it's impressive recent renovations. Perry's Hannah's beloved bronze statue at the corner of Sixth and Union Street is yet another example of his lasting leadership influence. Perry will on occasion be dressed anonymously as a caring tribute to Traverse City's founding father. Perry even has a Facebook page that features photo highlights of his many "gifts" over time as well as updates about this statue's educational opportunity for both residents and tourists. Congratulations to Marie and Garrett for your winning essays and thanks as well as to Perry Hannah and all of our community's visionary leaders past, present and future!